Hi all, we're working on the gameplay inside the house, one of the many locations you'll find in the game. Hi all, we're working on the gameplay inside the house, one of the many locations you'll find in the game. Here some pictures taken from outside. 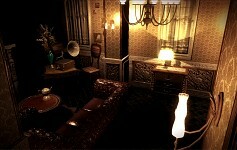 It's a nineteenth-century house with its story and its secrets that can be found solving the puzzles which are in there. The house is not only beautiful to see ( at least we hope you like it ) but you can also interact with most of the objects which are inside, whether it's a puzzle or a simple furniture. As you can see inside each room ( and each other location of the game ) there are many objects and there is no difference between them on screen. I want to say that there are no helpers to highlight objects you can pick up or you can interact with: in this way we want to increase game difficult but most of all we want to force exploration ( furthermore by looking everywhere you can find ammo or something else useful ) . Instead here you can see some technical detail: 1024 pxl normal mapped texture and the humidity effect that we like so much. Congratz with the many updates, it's nice to see this game evolve :). Looking forward to hear more about the story of the game!